Late check out (after 10:30 AM and before 2:00 PM) may result in a fee. Cancellations and/or modifications are FREE OF CHARGE if requested within the terms specified below and should be communicated by e-mail or phone call to our staff which is 24h available. For no/show or late cancellation the full amount of the reservation will be charged as penalty fee. Must cancel before 3 days before check in. City Tax: 4,00 Euros per person per night , for a maximum of 7 nights of City Tax , will be paid at time of arrival in cash due to government policy. Please inform Hotel Veneto in advance of your expected arrival time. You can use the Special Requests box when booking, or contact the property directly with the contact details provided in your confirmation. City Tax: City Tax ( €4.00 ) per person/night for a maximum of 7 nights will be paid at time of arrival in cash due to government policy. Children under the age of 12 years do not pay the local City Tax. Hotel Veneto Firenze, your hotel in the heart of Florence. Kindness, courtesy and professionalism of the helpful staff always ready to satisfy every need, so that you can breathe Florence, reliving your trip whenever you want with the mind and heart. 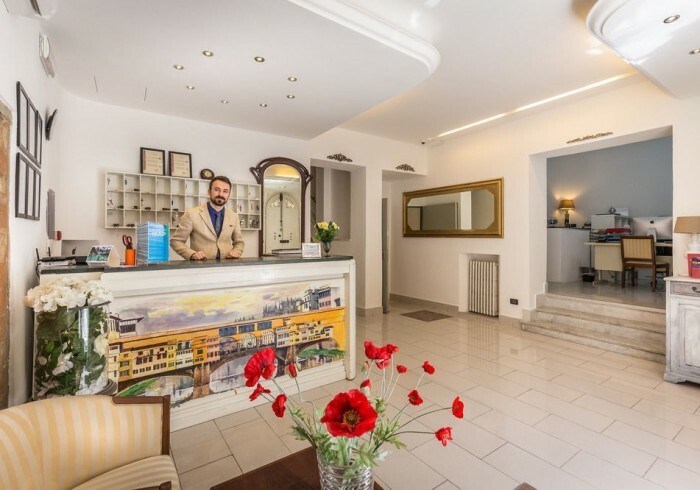 Hotel Veneto Firenze is located in a late 18th century building, on three floors (no elevator), within a short walk from the central Santa Maria Novella train station. Recently completely renovated, it's the ideal choice for business trips as well as leisure ones, thanks also to its strategic location a few steps from the Fortezza da Basso , the Palazzo dei Congressi and all major attractions of Florence like , Accademia gallery, Uffizi Gallery , Santa Maria del Fiore with Brunelleschi's Dome and Giotto's Bell Tower , Ponte Vecchio and Palazzo Pitti with the wonderful Boboli Gardens. Hotel Veneto Firenze is the perfect solution for groups and group holidays, thanks to the functional rooms and the proximity to the historic centre and the train station.